Accounting for both dimensions by trading on combined quality and price signals yields dramatic performance improvements over traditional value strategies. 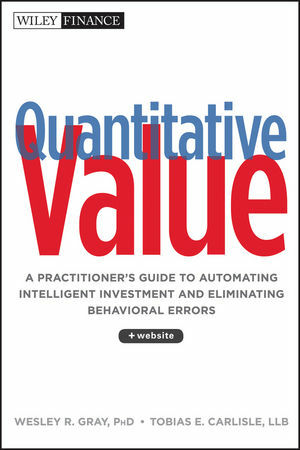 Accounting for quality also yields significant performance improvements for investors trading momentum as well as value. Novy-Marx’s The Other Side of Value paper showed that a simple quality metric, gross profits-to-assets, has roughly as much power predicting the relative performance of different stocks as tried-and-true value measures like book-to-price. Buying profitable firms and selling unprofitable firms, where profitability is measured by the difference between a firm’s total revenues and the costs of the goods or services it sells, yields a significant gross profitability premium. 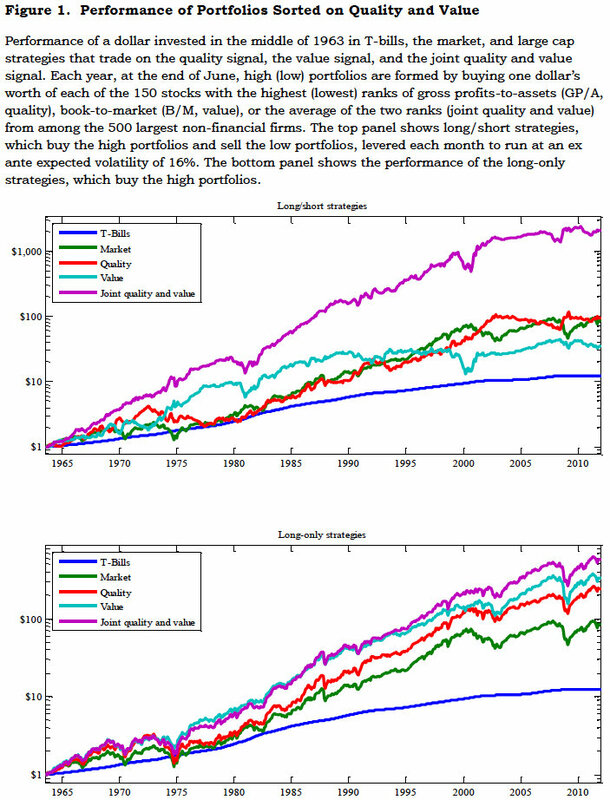 High quality firms tend to trade at premium prices, so value strategies that trade on quality signals (i.e., quality strategies) hold very different stocks than value strategies that trade on price signals. Quality strategies tilt towards what would traditionally be considered growth stocks. This makes quality strategies particularly attractive to traditional value investors, because quality strategies, in addition to delivering significant returns, provide a hedge to value exposures. 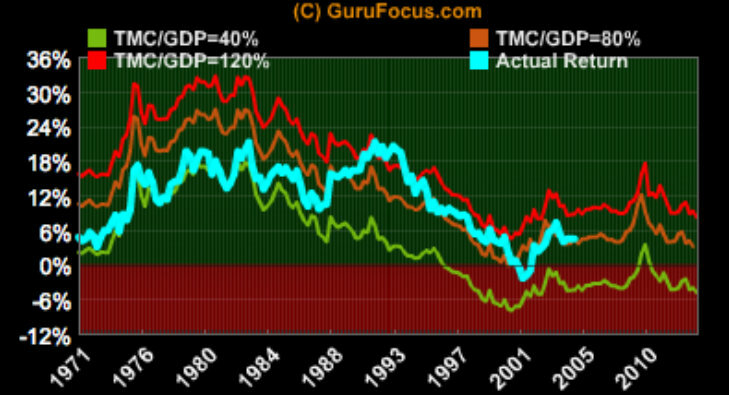 Figure 1 shows the performance of a dollar invested in mid-1963 in T-bills, the market, and strategies that trade on the quality signal, the value signal, and the joint quality and value signal. The top panel shows long/short strategies, which are levered each month to run at market volatility (i.e., an expected ex ante volatility of 16%, with leverage based on the observed volatility of the unlevered strategy over the preceding 60 months). 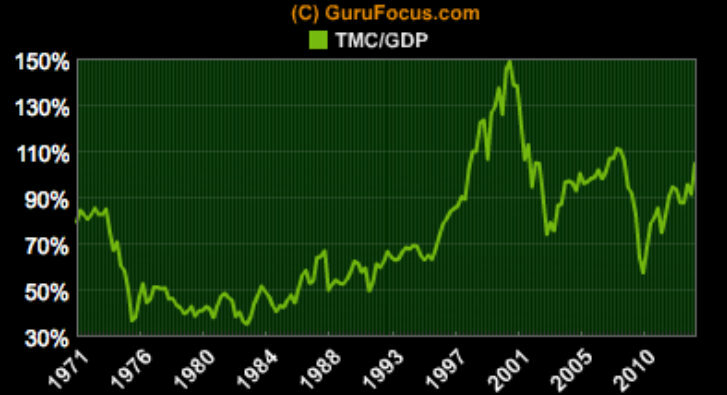 By the end of 2011 a dollar invested in T-bills in 1963 would have grown to $12.31. A dollar invested in the market would have grown to $84.77. A dollar invested in the quality and value strategies would have grown to $94.04 and $35.12, respectively. A dollar invested in the strategy that traded on the joint quality and value signal would have grown to more than $2,131. The bottom panel shows the performance of the long-only strategies. While a dollar invested in the market would have grown to more than $80, a dollar invested in profitable large cap stocks would have grown to $241, a dollar invested in cheap large cap stocks would have grown to $332, and a dollar invested in cheap, profitable large cap stocks would have grown to $572. 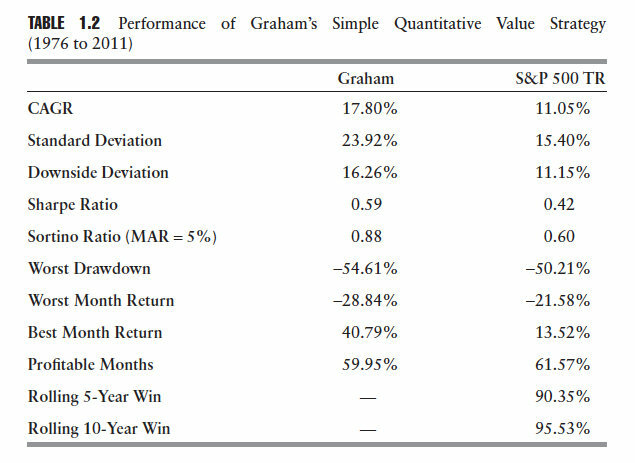 Figure 2 shows the drawdowns of the long/short strategies (top panel) and the worst cumulative under performance of the long-only strategies relative to the market, i.e., the drawdowns on the long-only strategies’ active returns (bottom panel). The top panel shows that the worst drawdowns experienced over the period by the long/short strategies run at market volatility were similar to market’s worst drawdown over the period. 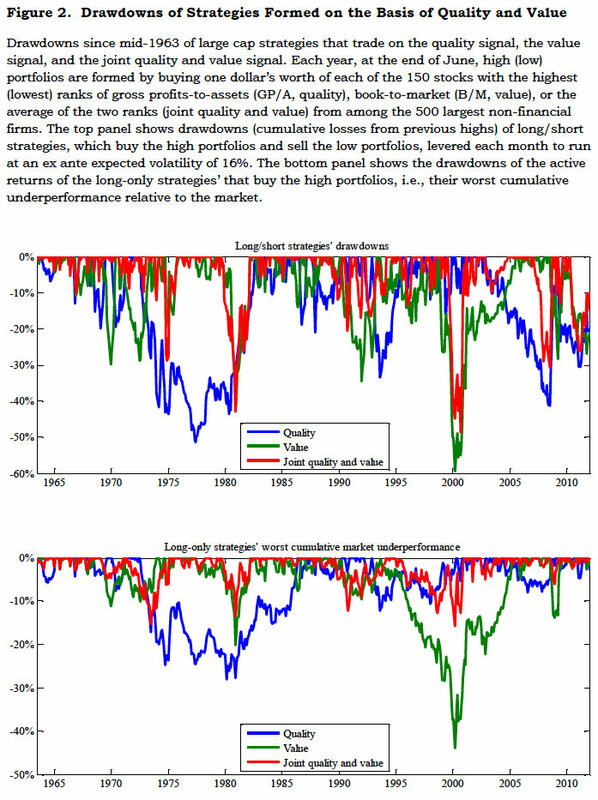 The joint quality and value strategy had, however, the smallest drawdowns of all the strategies considered. Its worst drawdown (48.7% in 2000) compares favorably to the worst drawdowns experienced by the market (51.6% in 2008-9, not shown), the traditional value strategy (down 59.5% by 2000), and the pure quality strategy (51.4% to 1977). Similar results hold for the worst five or ten drawdowns (average losses of 35.5% versus 41.1%, 38.9%, and 35.6% for the worst five drawdowns, and average losses of 25.8% versus 28.5%, 28.7%, and 26.5% for the worst ten drawdowns). 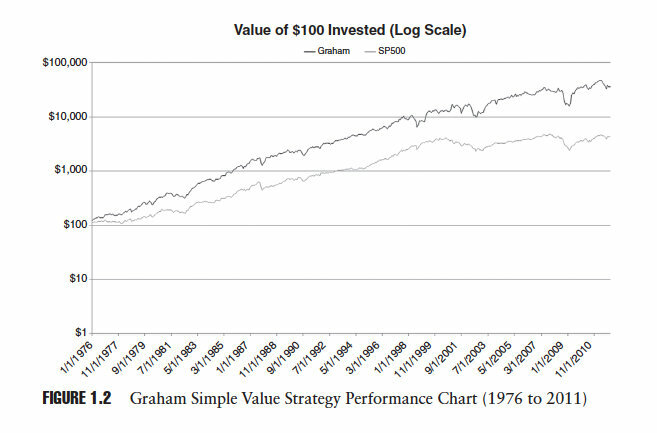 The bottom panel shows even more dramatic results for the long-only strategies active returns. Value stocks underperformed the market by 44% through the tech run-up over the second half of the ‘90s. Quality stocks lagged behind the market through much of the ‘70s, falling 28.1% behind by the end of the decade. Cheap, profitable stocks never lagged the market by more than 15.8%. Periods over which these stocks underperformed also tended to be followed quickly by periods of strong outperformance, yielding transient drawdowns that were sharply reversed. Importantly, the signal in gross profitability is “extremely persistent,” and works well in the large cap universe. Profitability strategies thus have low turnover, and can be implemented using liquid stocks with large capacities. Novy-Marx’s basic message is that investors, in general but especially traditional value investors, leave money on the table when they ignore the quality dimension of value. 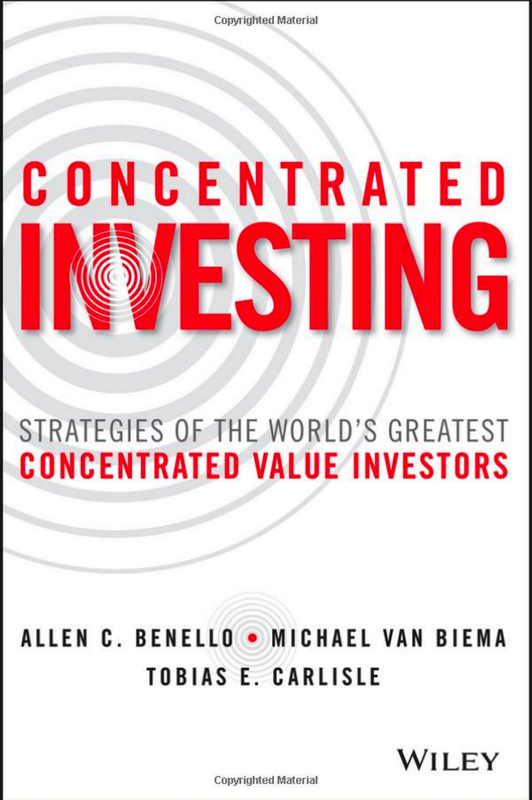 Read The Quality Dimension of Value Investing (.pdf). Tomorrow, I show in an extract from Quantitative Value how we independently tested gross-profits-on-total-assets and found it to be highly predictive. Richard Zeckhauser’s Investing in the Unknown and Unknowable (.pdf) is a fantastic 2006 paper about investing in “unknown and unknowable” (UU) situations in which “traditional finance theory does not apply” because each is unique, so past data are non-existent, and therefore an obviously poor guide to evaluating the investment. David Ricardo made a fortune buying bonds from the British government four days in advance of the Battle of Waterloo. He was not a military analyst, and even if he were, he had no basis to compute the odds of Napoleon’s defeat or victory, or hard-to-identify ambiguous outcomes. 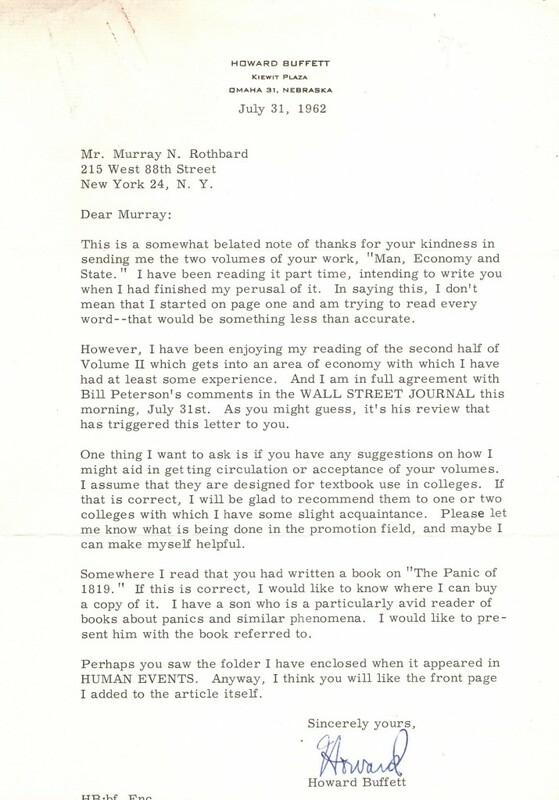 Thus, he was investing in the unknown and the unknowable. Still, he knew that competition was thin, that the seller was eager, and that his windfall pounds should Napoleon lose would be worth much more than the pounds he’d lose should Napoleon win. Ricardo knew a good bet when he saw it. Ricardo allegedly made 1 million pounds (over $50 million today) – roughly half of his fortune at death – on his Waterloo bonds.5 Buffett has made dozens of equivalent investments. Though he is best known for the Nebraska Furniture Mart and See’s Candies, or for long-term investments in companies like the Washington Post and Coca Cola, insurance has been Berkshire Hathaway’s firehose of wealth over the years. And insurance often requires UUU thinking. Some UU situations that appear to be unique are not, and thus fall into categories that lend themselves to traditional speculation. Corporate takeover bids are such situations. When one company makes a bid for another, it is often impossible to determine what is going on or what will happen, suggesting uniqueness. But since dozens of such situations have been seen over the years, speculators are willing to take positions in them. From the standpoint of investment, uniqueness is lost, just as the uniqueness of each child matters not to those who manufacture sneakers. Maxim A: Individuals with complementary skills enjoy great positive excess returns from UU investments. Make a sidecar investment alongside them when given the opportunity. Maxim B: The greater is your expected return on an investment, that is the larger is your advantage, the greater the percentage of your capital you should put at risk. Maxim C: When information asymmetries may lead your counterpart to be concerned about trading with you, identify for her important areas where you have an absolute advantage from trading. You can also identify her absolute advantages, but she is more likely to know those already. Maxim D: In a situation where probabilities may be hard for either side to assess, it may be sufficient to assess your knowledge relative to the party on the other side (perhaps the market). Maxim E: A significant absolute advantage offers some protection against potential selection. You should invest in a UU world if your advantage multiple is great, unless the probability is high the other side is informed and if, in addition, the expected selection factor is severe. Maxim F: In UU situations, even sophisticated investors tend to underweight how strongly the value of assets varies. 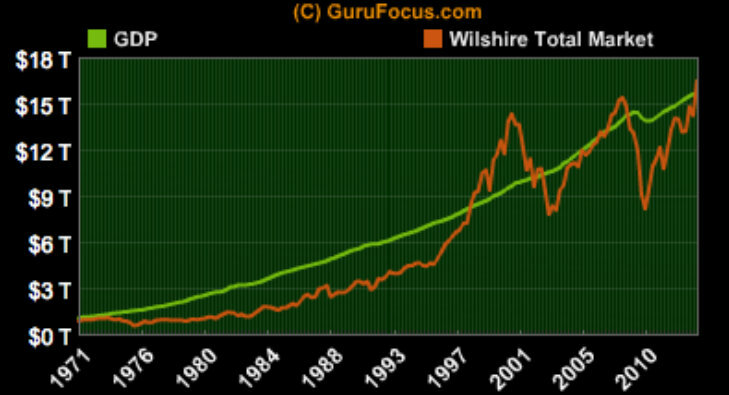 The goal should be to get good payoffs when the value of assets is high. Maxim G: Discounting for ambiguity is a natural tendency that should be overcome, just as should be overeating. Maxim H: Do not engage in the heuristic reasoning that just because you do not know the risk, others do. Think carefully, and assess whether they are likely to know more than you. When the odds are extremely favorable, sometimes it pays to gamble on the unknown, even though there is some chance that people on the other side may know more than you. Read Investing in the Unknown and Unknowable (.pdf). Do confidential hedge fund portfolio holdings generate superior performance? What do requests for confidentiality reveal about hedge fund portfolio holdings? In Uncovering Hedge Fund Skill from the Portfolio Holdings They Hide, a paper to be published in the upcoming Journal of Finance (or see a February 2012 version on the SSRN), authors Vikas Agarwal, Wei Jiang, Yuehua Tang, and Baozhong Yang ask whether confidential holdings exhibit superior performance to holdings disclosed on a 13F in the ordinary course. Institutional investment managers must disclose their quarterly portfolio holdings in a Form 13F. The 13(f) rule allows the SEC to delay disclosure that is “necessary or appropriate in the public interest or for the protection of investors.” When filers request confidential treatment for certain holdings, they may omit those holdings off their Form 13F. After the confidentiality period expires, the filer must reveal the holdings by filing an amendment to the original Form 13F. Confidential treatment allows hedge funds to accumulate larger positions in stocks, and to spread the trades over a longer period of time. Funds request confidentiality where timely disclosure of portfolio holdings may reveal information about proprietary investment strategies that other investors can free-ride on without incurring the costs of research. The Form 13F filings of investors with the best track records are followed by many investors. Warren Buffett’s new holdings are so closely followed that he regularly requests confidential treatment on his larger investments. Hedge funds seek confidentiality more frequently than other institutional investors. They constitute about 30 percent of all institutions, but account for 56 percent of all the confidential filings. Hedge funds on average relegate about one-third of their total portfolio values into confidentiality, while the same figure is one-fifth for investment companies/advisors and one-tenth for banks and insurance companies. Hedge funds with characteristics associated with more active portfolio management, such as those managing large and concentrated portfolios, and adopting non-standard investment strategies (i.e., higher idiosyncratic risk), are more likely to request confidentiality. The confidential holdings are more likely to consist of stocks associated with information-sensitive events such as mergers and acquisitions, and stocks subject to greater information asymmetry, i.e., those with smaller market capitalization and fewer analysts following. Confidential holdings of hedge funds exhibit significantly higher abnormal performance compared to their original holdings for different horizons ranging from 2 months to 12 months. For example, the difference over the 12-month horizon ranges from 5.2% to 7.5% on an annualized basis. Read a February 2012 version on the SSRN.